St Vincent’s as The Commandery of Lochore 1967-1996 – St Vincent's Chapel, Edinburgh, the village church in the heart of the city. One of the most striking features of St Vincent’s is the present decor which was largely added in the 1970s and 1980s as a result of the building’s connection with the Order of St Lazarus. The majority of the stained glass windows, the shields, smaller and larger achievements (or coats of arms) are associated with this period. This decoration is largely one man’s vision of what a collegiate church of an heraldic order should look like. 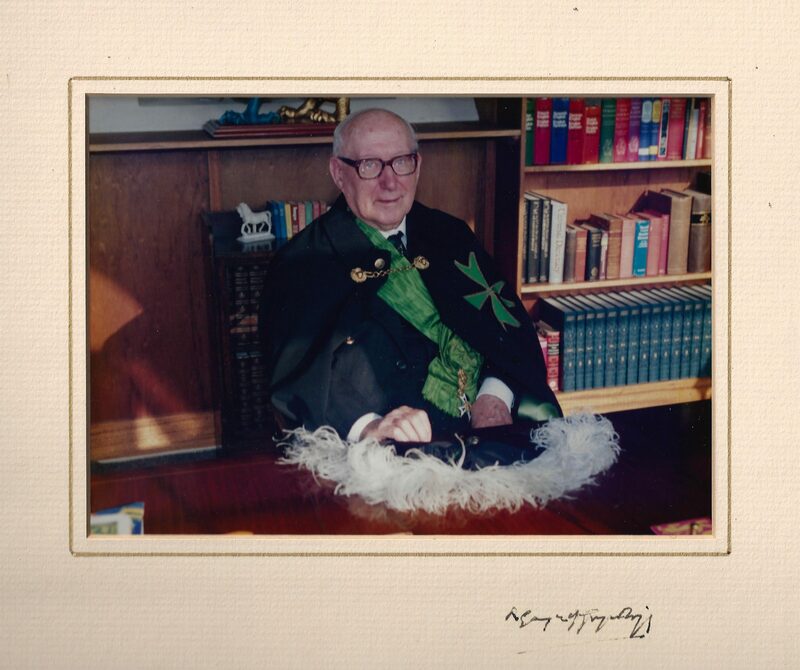 This was Lieutenant Colonel Robert Gayre of Gayre and Nigg, Baron of Lochore (1907 – 1996). Colonel Gayre purchased Lochore or Inchgall, a ruined castle in Fife to which was attached a baronial title, in the 1960s from the National Coal Board. In 1967 he also established a Commandery of the Order of St Lazarus, originally a hospitaller order set up in the Holy Land in the twelfth century. When Colonel Gayre set up the Commandery, he arranged for St Vincent’s to become its official church, its collegiate chapel. Colonel Gayre purchased the church in 1971 from the Diocese of Edinburgh. He intended to pass use and ownership of the church and church hall – together with other assets such as the Castle of Lochore – to the Order. 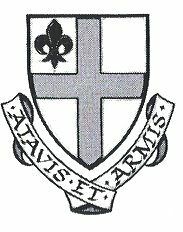 St Vincent’s was the first church to have been acquired by the Order of St Lazarus since the reformation. It was to be the seat of the Commandery of Lochore. It was also to remain as a parochial church for as long as the Episcopal congregation continued to exist. The Rector or Priest-in-Charge was to be appointed by the order. 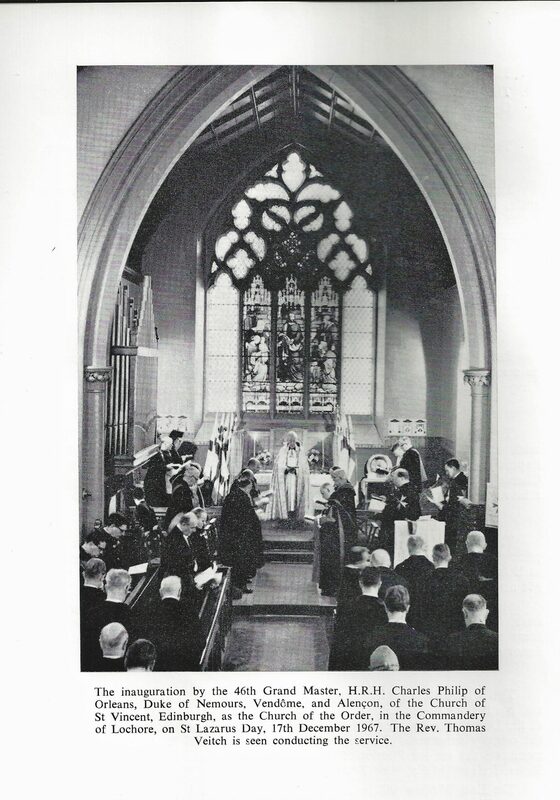 Between 1965 and 1971 St Vincent’s had been in an association with the church of St Paul and St George in Edinburgh’s York Place – the Reverend Tom Veitch being the incumbent of St Paul and St George. St Vincent’s Church became the official chapel of the Commandery of Lochore on its establishment in 1967, the Dean of the Commandery being the Reverend Veitch and Officiating Chaplain being the Reverend H T Coles. Lochore differed from other provinces in that it was a Commandery and had direct access to the Grand Master. The other English speaking provinces were known as Bailiwicks (Scotland, England, Canada, Ireland, South Africa etc) and had an intermediary between themselves and the Grand Master. The Arms of the Commandery of Lochore and the Grand Bailiwicks of Scotland, England and Canada, and Bailiwicks of Ireland and Southern Africa. Lyon Court 26th September 1967. The completion of the purchase of St Vincent’s by Colonel Gayre finally took place in 1971 following approval of the Vestry committee – many of whom were members of the order. (First) THE HONOURABLE LORD CAMERON, 28 Moray Place, Edinburgh, (Second) KENNETH JOHN CAMERON, 10 Belford Terrace, Edinburgh, (Third) ROBERT JAMES MuMBERSON, 3 Dean Park Terrace, Edinburgh, (Fourth) DAVID WISHART SMITH, 5 Saint Stephen Street, Edinburgh, (Fifth) JAMES MACPHERSON, 116 Saint Stephen Street, Edinburgh, (Sixth) WILLIAM GuLLAND, 60 Pilton Place, Edinburgh, (Seventh) REINOLD GAYRE OF GAYRE AND NIGG, The Younger, I Darnaway Street, Edinburgh, (Eighth) MRS CHARLOTTE FALCONER GRANT or MANN, 42 Elm Row, Edinburgh, (Ninth) MRS MARY JOSEPHINE MEASHAM or MACPHERSON, 116 Saint Stephen Street, Edinburgh, (Tenth) MRS MARGARET ANDERSON or AFFLECK, 85 Cuiken Terrace, Penicuik, (Eleventh) ANDREW SMITH-DORRIEN RODGER, 4 Randolph Crescent, Edinburgh, and (Twelfth) },Mrs EDITH ELSIE RODGER, 4 Randolph Crescent, Edinburgh, being the whole surviving members of the Vestry of St Vincent Church, Edinburgh, and as such trustees under the Trust constituted by the Disposition by William Forbes Skene in favour of the Vestry of St Vincent Church dated 22nd and recorded in the Division of the General Register of Sasines applicable to the County of Edinburgh 26th, both days of March, 1883. The Lords having heard Counsel and considered the Petition and Proceedings along with the Report of Kenneth Morton Croft Gray, W.S., No. 21 of Process; Approve of said Report; Allow the Petition to be amended as proposed at the Bar; Grant Warrant and authorise the Petitioners as Trustees and to their successors in office to sell and dispose of the heritable subjects specified and described under heads 1 (a) and (b) of the prayer of the Petition, which specification and description are here referred to and held as repeated brevitatis causa; Approve of sale of the said subjects by private bargain as a whole to Lt. Col. Gayre of Gayre and Nigg described in the prayer of the Petition on such terms as the Petitioners may consider most beneficial to the Trust Estate and for this end to enter into missives of sale, grant Disposition containing all necessary clauses, etc. necessary for rendering such sale effectual; Approve of the proposed Scheme appended to the Petition and settle the same as a Scheme for the administration of the funds held by the Petitioners as Trustees of the Vestry of St Vincent Church. Edinburgh; Direct that the said funds shall be administered in accordance with the said Scheme and decern; finds the Petitioners entitled to the expenses of this application and proceedings following thereof out of the said funds and remit the Account thereof, when lodged, to the Auditor of Court for taxation. Following which it was conveyed to Lt-Colonel Gayre of Gayre and Nigg, Hereditary Commander. Even before ownership had passed to Colonel Gayre it was his intention to pass use and ownership of St Vincent’s and its church hall – together with other assets such as the Castle of Lochore – to the order to be held by trustees appointed by the Commandery. 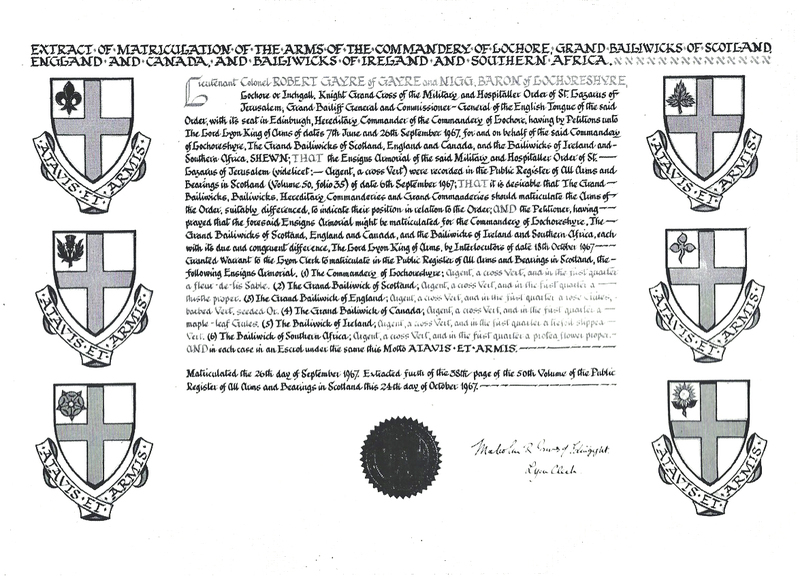 The ownership was gifted as a hereditary fief to the order subject to Colonel Gayre and his successors adopting the title of Grand Commander of the order. This acquisition was the first church to have been acquired by the order since the reformation. It was to be the headquarters of the Vice Chancery of the Overseas Territories of the order (the equivalent of the former ‘Scottish and English Tongues’). Additionally the church was not only to be the seat of the Commandery of Lochore but was also to remain as a parochial church for as long as the Scottish Episcopal congregation continued to exist, being licensed as a private chapel within the Diocese of Edinburgh. However the chaplain was to be appointed by the order. Amongst the plans and proposals for the church were the following:• A lecture hall, library and museum were to be established in the crypt. • There were to be two double rows of knight’s and commander’s stalls along the two sides of the nave. During this period, apart from the armorial embellishments added to the church, considerable work was done on the re­-slating of the roof, an organ from Christ Church, Trinity was provided and lavatories were installed. Whilst there had been plans to use the church hall on St Stephen Street as the headquarters of the ambulance service this did not come to fruition. It was lightly used and was sold during the chaplaincy of the Reverend David Lumgair. The Church was used not only for ceremonial purposes by the order but also by individual members for the normal Sunday services. A choir, which had been in existence prior to the order taking control of the church, continued until the late 1980s. It was an adult choir, the membership being between 6 and 8. It ceased after one family, who comprised several of its members, moved from the area. One of the stipulations of Colonel Gayre was that the liturgy of the Scottish Episcopal 1929 Prayer Book should be used. On ceremonial occasions members of the order dressed in St Stephen’s Church opposite prior to processing to St Vincent’s. Ceremonial use by the order was relatively light – usually an annual investiture. Apart from members of the order these were open to members of the congregation and the public. Whilst the order was split in Scotland the Paris Obedience (Grand Bailiwick of Scotland) were allowed to use St Vincent’s on occasion for their investitures etc. Shortly before Colonel Gayre died in 1996 a number of members wished to form their own Commandery. This group then linked with the Grand Bailiwick of Scotland (Paris Obedience) run by Lord Borthwick. Colonel Gayre was advised of the situation and an attempt was made by senior members of the order who remained loyal to the Commandery of Lochore to contact members of the order to ascertain their views. Membership details had gone missing and only a limited number could be contacted. Colonel Gayre put the Commandery of Lochore into limbo – a situation that can only be changed by a petition to the Court of Session. Since this time the order has ceased to use the church, allowing it to be used exclusively by the Scottish Episcopal congregation.